Departamento de Projeto Mecanico - Faculdade de Engenharia Mecanica - UNICAMP. Rua Mendeleiev, s/n - Cidade Universitaria “Zeferino Vaz” - Barao Geraldo - Caixa Postal 6122 - CEP: 13.083-970 - Campinas - SP, Brazil. 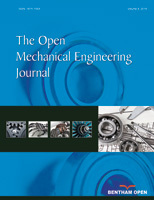 The paper addresses the optimal design of parallel manipulators based on multi-objective optimization. The objective functions used are: Global Conditioning Index (GCI), Global Payload Index (GPI), and Global Gradient Index (GGI). These indices are evaluated over a required workspace which is contained in the complete workspace of the parallel manipulator. The objective functions are optimized simultaneously to improve dexterity over a required workspace, since single optimization of an objective function may not ensure an acceptable design. A Multi-Objective Evolution Algorithm (MOEA) based on the Control Elitist Non-dominated Sorting Genetic Algorithm (CENSGA) is used to find the Pareto front.